Bridge lights have to be functional because of what passes underneath and travels up above. On the bridge, people need light to see where they are walking or driving, but in order for that traffic to travel in some manner of comfort others passing around the bridge have to know it is there. For towers, this means lights bright enough to alert air traffic that something could be obstructing their path, and those wishing to pass below need to have some idea where the supports are. Unfortunately these are often objects more of function than fashion. Bridges are put there to do a job and dandying them up may detract from their purpose. A low point is crossed and there is no need to make a show in doing so. Fortunately, many believe that a bridge is the best place to enhance the look and style of a city. Neon, as most aficionados understand, is a relatively inexpensive lighting method. The gas impregnated tubes offer more light than a standard bulb at a lower cost. The advent of technologies such as light-emitting diodes (LED) has surpassed neon as a cheap source of light, but there are still ways in which neon outperforms LED, such as color and style. A few cities have decided that due to the unique aspect and the color palette available through neon, that they would adorn a local bridge in this unique style. In Shreveport, Louisiana, The Texas Street Bridge crossing over the Red River to Bossier City was hung with more than 7000 feet of orange neon tubes to create a signature piece of public art that would transform the bridge in the nations largest neon sculpture. It also provides some local flavor for tourists. The Xiying Rainbow Bridge located in Magong, Taiwan is an elevated pedestrian walkway. The bridge is lined with a thin neon band that reflects a rainbow onto the water’s surface below at night. 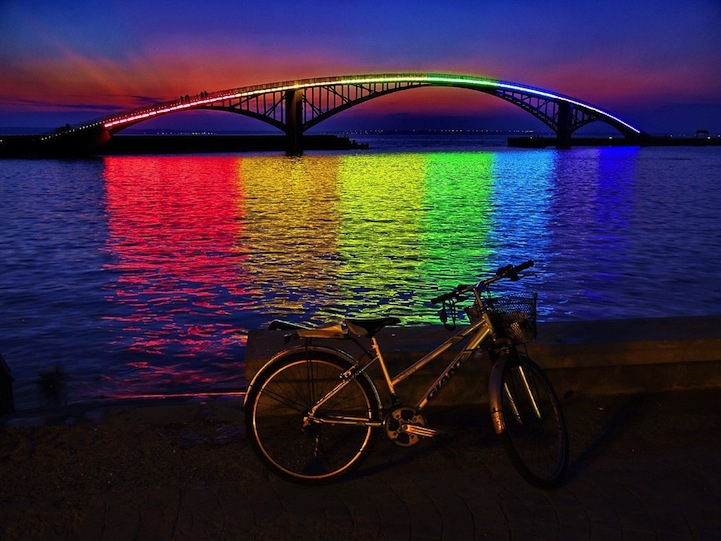 Neon lights affixed to the side of the bridge illuminate the water, below, following a rainbow’s spectrum of colors. For show and distinction, what else could a city want. Check the internet for uniquely marked neon-lighted bridges. They create a remarkable light show that should not be missed. Do you have a local bridge illuminated in the glow of neon near you? Tell us about it.